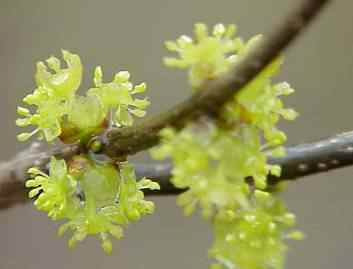 Description: Spring is the best time to to get aquainted with the Spicebush, it displays countless clusters of waxy little yellow flowers on dark branches bare of leaves. More a shrub than tree usually occurs in clumps in shady moist ground, with individual stems radiating outward and upward on a slant to a height of 4 to 15 feet. The leaves appear later and are about 2 to 5 inches long, smooth and taper at both ends. The fruit ripens in late summer, is a small partially flattened red "drupe", enclosing a single stone. 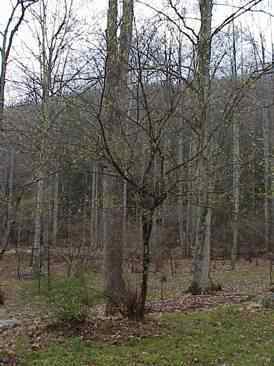 The Spicebush gets it name from the citronella like order that comes from any part of the plant when crushed.